"Woah! What happened? Is she okay? Have you stopped the bleeding? How big is it?" After a little bit more talking and questions, it was determined that Chloe needed medical attention and quickly. I thought, from the description of the wound that a few minutes and a tube of derma-bond, would be enough for her. So we went on to the doctor's office. I had a huge amount of mommy guilt for not turning around and heading back to Opp when we found out what really happened to Chloe. And here, in an eyewitness account written up by TeeTee, is what went on in the ER. I was on babywatch at work so would check my phone every hour or so to see if J.B. was coming early. I just happened to check my phone and I did indeed have a missed call from Jeremy. Was this it? Had labor started? Was I going to get the rest of the week off from work? I called the house phone and there was no answer so I immediately called the gray house. Granna answered the phone with a shaky voice and when I asked her what was going on she said she was getting dressed to bring Chloe to the hospital because she fell of the back steps and cut her head and it needed to be looked at. So, I anxiously waited the few minutes it took them to arrive. Granna brought Chloe in and thank goodness the cut was not on her face but as soon as she turned her head I saw that blood had run all the way down to the very tips of her head and I am not a nurse but have seen enough lacerations that I knew just by looking that she would need at least a stitch or two. So, it was going to be up to Granna and myself to see Chloe through her first, and hopefully last, stitch up. I sat on the gurney by Chloe as we answered questions about her medical history to the best of our knowledge and Granna explained the details of the accident. Up to this point Chloe had not spoken and I could tell by the way she was holding her hands so still on her legs that she was tense. She just took in her surroundings and listened. Then it came time for the pulse ox to be placed on her finger. She didn't willingly hold up her finger so I put it on mine to show her that it didn't hurt. Then the nurse tried to put it on Chloe and see went to Def-Con 4 in an instant. She balled her fists up to hide her fingers and started screaming "Never! Never!" at the top of her lungs. She screamed and begged to go home and the real work of the visit hadn't even begun. Once they realized the pulse ox was a no go, they just decided to go straight to sewing her up. First, they tried to put her on a miniature back board to restrain her but because of the location of the boo-boo, they had to take her off the board and roll her in a sheet. Newborns may like to be swaddled but a scared 4 year old will protest that type of confinement. 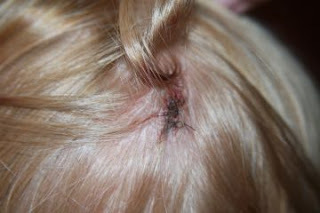 Once she was adequately rolled and positioned on the gurney, she received three shots around the edges of the boo-boo and the doctor put in 2 stitches. As soon as the shots went in Chloe quieted and didn't make another sound. Once it was all done and the drape was removed from her head we realized she was asleep. This almost scared me more than the laceration. Did she have a concussion? Was she so traumatized by what just happened that she had gone into some kind of trance? I was able to wake her up after a couple of minutes and I think that she was so stressed after fighting so hard that she just crashed. Granna and I took her to the vending machine for Cheetos and she started talking a little bit. After work I went by to check on her and she acted as if nothing had happened and she was no worse for the wear. It was a very difficult position to be in because I never want the now 4 kiddos to associate me with negative experiences or for one of them to think that I would stand by and let someone hurt them. But, there is no way that I could have let Chloe go back there without me and I hope that if she hasn't forgotten, she has forgiven. I took this picture because Chloe wanted to see what her stitches looked like and this was the easiest way. After so much time has passed, she seems to be okay about the whole thing. I still feel guilty about not being there for her. I did take her to get her stitches out and was able to hold her head while they did it. She did well with no screaming or crying and even brought her stitches home taped to a small piece of paper. It is hanging on the fridge right next to their latest artwork.